Bike Check Dumpster Edition yo! Discussion in 'BMX & Dirt Jumping' started by dan wask, Jan 8, 2008. So there I was looking for pallets in the dumpster behind the old friendly's. I look, and what do I see! I bicycle buried under banana peels, melted icecream and bags for tea! Turns out it was a rockstar bike's frame that I couldn't identify. Left side drive. The bb was trashed, there was water in there and it looked like it had been ridden with one of the cups removed. No matter, shes mine now! Heres what I've put together from my dumpster find for a total of $54.28 and some spare time. 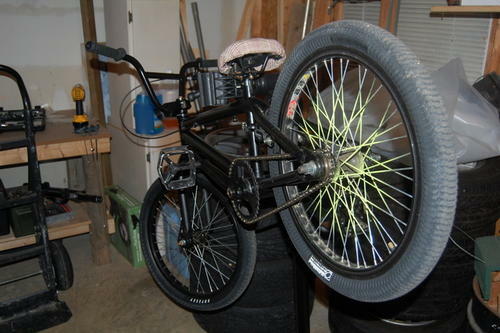 New bb, new chain, new tires, recovered seat, new cable, removed gyro, and new freewheel. However, the spindle is bent, as is the chainring. Because the spindle is bent, I'll have to replace the crankset and bb sometime in the near future. I'm going to break this for you. Should have left it there and you'd be 54 dollars and 28 cents richer. There is no B like a Free-B!! 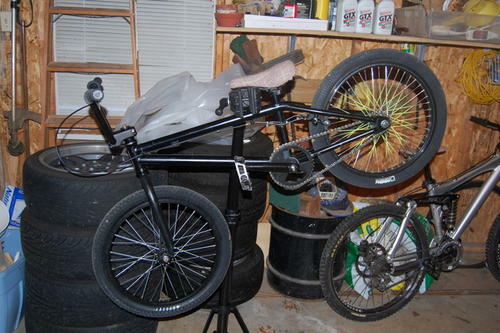 lol thats awesome, good way to start your year, with a free BMX bike. Looks like a great find. The only bummer I can think of is it might be a stolen bike that was just tossed. If you haven't already, I'd check a couple of the LBS's in the area to see if one was reported stolen. Bad Karma if you don't try to find the owner. I work at the closest bike shop to the dumpster. If anyone comes in looking for their bike, I'll have it and be happy to give it back in the condition it was found. To someone who knows little about bicycles and bicycle repair, the bike would have easily been considered trash in the state it was before. There were other toys (kiddie pool, plastic fisher price style slide) in the dumpster, it looked like garage cleanout. Do I feel guilty? No, I don't think it is stolen, or lost. Good to hear Dan, just reading the description of where it was found - it really sounded like it could have been a stolen then ditched bike. So what if you got money from a bank, store, whereever and in its history it was stolen at one point......would you give it back? good luck tracing theta bike back lando. nice find dan! this is the classified entry you could post: black bike found. in dumpster. anyone? can i eat dinner off your chainring? Haha about that... I'll be rocking that old school size ring because I don't want to put anymore money into a cassette style hub. However, the headset asploded on me today, so that'll have to get replaced. about another 20$ into the db. I'd hit that. Nice score! The neighbors found a unicycle in the trash last month.